USED BOOK SALE – We Want Your Books and We Need Your Help! The Book Sale is an opportunity for both kids and adults to purchase used books in their native tongue or another language at bargain prices. Please donate books that you don't need any more, so that other families can enjoy them! During the Book Drive in the ECC, ES and MS books are collected in their homerooms/bases. HS students can donate books at two places- there will be box with tally sheet located in front of the library and in the DP Lounge – B5/G29. 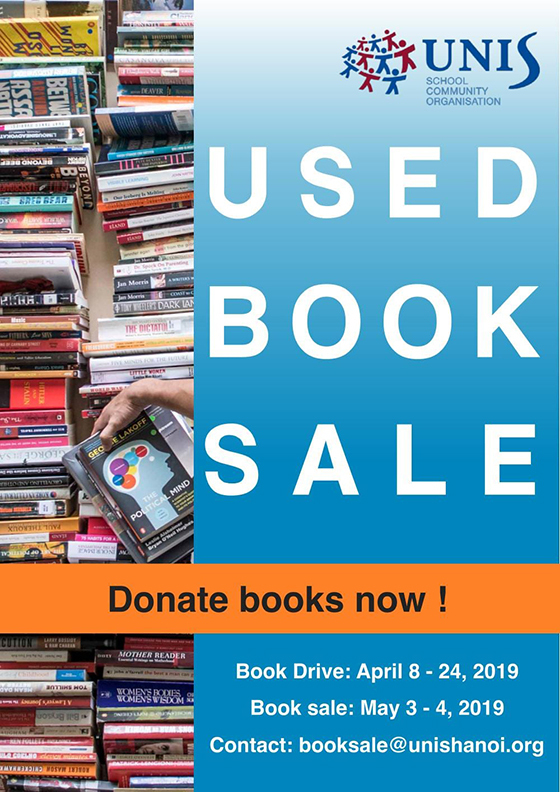 We also greatly appreciate your help to sort all donated books on Thursday April 18 + 25 and Friday the 26, and to assist sales on Friday May 3 and Saturday May 4. Types of books collected: Kids' books, adults' books, fact or fiction, English, Vietnamese, Korean, Japanese, German, Swedish, French – We are interested in books on any subject, in any language spoken within the UNIS Hanoi community. If it's a book that someone else might enjoy, donate it. Please no outdated travel guides, class readers or inappropriate books please! Funds raised from the SCO Book Sale will be used to empower a variety of literacy projects created and led by UNIS Hanoi students through our Service Learning Programme. Students can apply for literacy funds HERE. For example, helping to create a community school library in Pu Bin and Sapa. During the book sale students will create project displays for the community to see where raised funds go!